'I am not ready for this yet'. Each winter, you hear this. Seriously, I don't think that I ever thought that way till last weekend when the first snow showered on us. I always wished for more Sunlight and longer daytime though. Nature seemed to be not ready yet as the trees were still bearing the colorful leaves while the gusts of chilling snowflakes were dumped over these leaves. I was not expecting the snow to be this early; it looks more like January when piles of snow appear on the sides of the roads. Boots, jackets, scarves, gloves...there goes the list. All are out now and I love it!!! Thanksgiving is around the corner and I bet you all are ready to go on a baking spree. Did you pick the bird to bake? Did you sort out the menu for the Thanksgiving dinner? Here is a perfect lip smacking appetizer that you can serve for Thanksgiving. 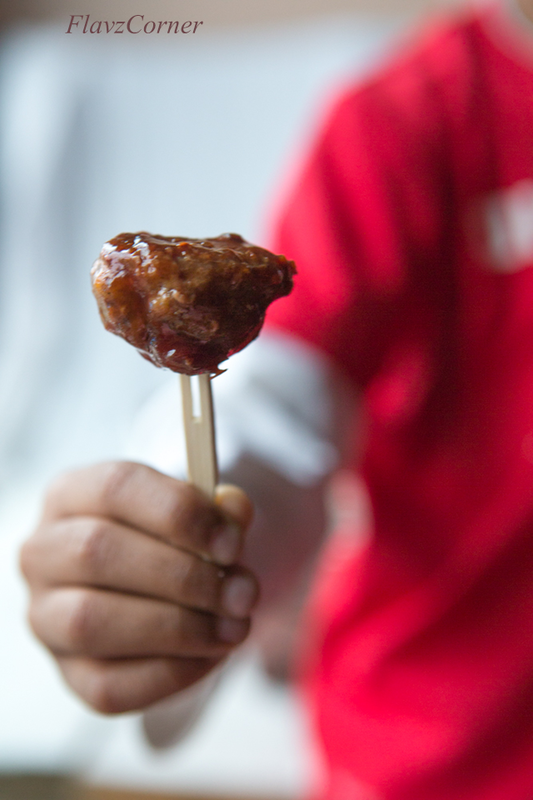 These meatballs got the zing that makes you go for more. The picky eater in my house was well impressed by the taste and he didn't even care when I told him that I made it with turkey meat which he dislikes. It was a big hit in my house and I even packed some in thermos for their lunch. I think I said enough about the meatballs. Let’s dig into the recipe. Mix all the ingredients for the meatballs together and roll them into balls with 1 tbsp. of the mix for each ball. Line a baking sheet with aluminum foil. Apply cooking spray and bake the meatballs for 30 minutes or till the center is no longer pink. You may have to do this in 2/3 batches. Meanwhile the meatballs are baking, you can make the sauce. In a sauce pan add the cranberries and 4 tbsp. of brown sugar, cook on low heat. The cranberries starts to pop. Use a wooden spoon to mash the cranberries and cook on low for 15 minutes. Add the orange juice, chili flakes and barbecue sauce and let it simmer for 10-15 minutes. The sauce starts to thicken. Turn off the flame. 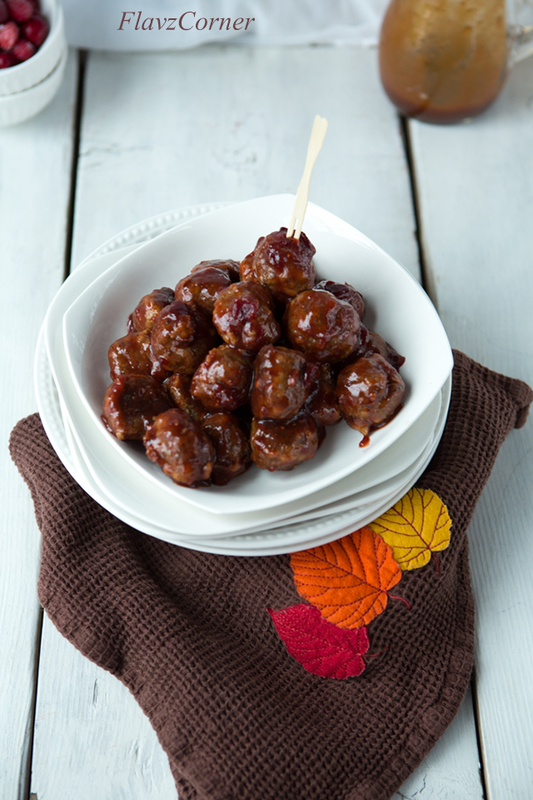 Place the meatballs in a heat proof bowl that can hold all of them. Pour the sauce over the meatballs. 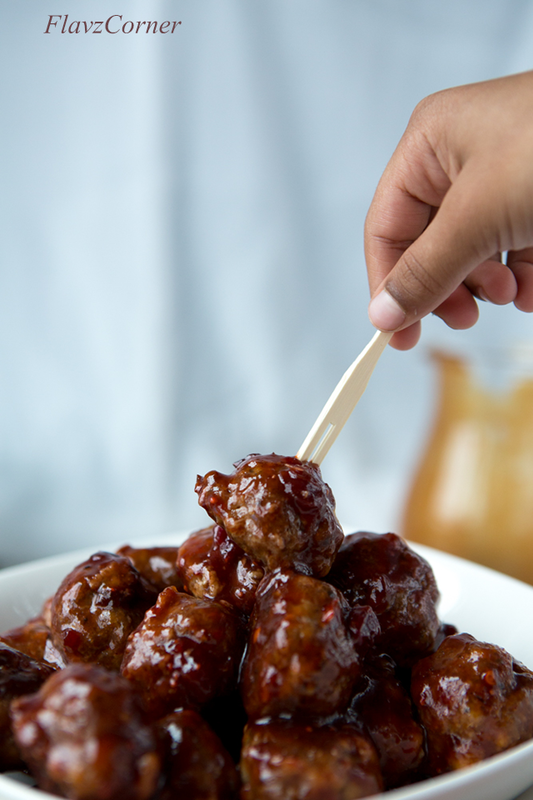 Gently shake the bowl to coat the sauce on the meatballs. Let the meatballs cool for 5 minutes. The sauce will stick to the meatballs forming the glaze. Enjoy them while they are warm. The left overs can be refrigerated up to a week in air tight container or they can be stored in the freezer for later use. Like the recipe suggests, you can use any ground meat of your choice. You can use Cranberry Jelly if you don't have fresh/frozen cranberries. You may have to adjust the amount of sugar as the cranberry jelly is already sweet. The fresh cranberry imparts a nice taste and I liked biting into the skin of cranberry along with the meatballs. Adjust the amount of seasoning per your taste. Frozen meatballs can be either heated in microwave or in the oven. Pre heat the oven to 350 F, line them on a greased baking sheet and cook for 15-20 minutes or till done. Quite a smashing thanksgiving you are going to have with that recipe on hand. Looks exotic and so yum! That cranberry sauce looks so so delicious! Love this as a party appetizer!! That sticky glaze looks amazing! 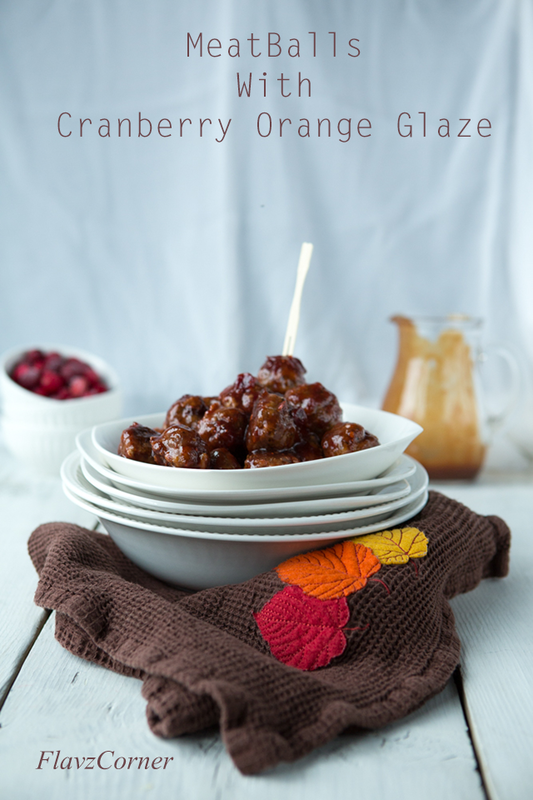 Those meat balls look yummm very interesting with cranberry and orange juice...I am sure kids will really like the sweet and spice part. What a great dish! And so appropriate for the season -- love the glaze on this. Thanks, and Happy Thanksgiving! Good morning and Happy Thanksgiving to you and your family. I love this recipe Shibi, I imagine it might be delicious. I'm going to pin it into my 'in the kitchen' folder so one of these days I can try it. Beautiful clicks Shibi and the meatball dish with that sauce sounds terrific. I am keen to try the cranberry sauce.